Look for prices to be up in SW Florida about 17% and single family home sales up about 3% over last year. Condo prices in April 2011 will show a 4% rise and condo sales rose 8%. Look for a detailed report in next week’s article. Most people refer to 2005 as the boom times for SW Florida real estate, and ask when we’re going to return to those days. I guess the partial answer is we’ve not only returned top those days, but we’ve far surpassed the boom times, at least in terms of transactions. 2009 was our busiest year on record followed closely by 2010, not the year 2005 as many people would guess. 2005 produced 12,273 single family home sales compared to 15,205 in 2010 and 16,260 in 2009. In the 1st quarter of 2011 we had 3,819. As you can see by the attached chart, 2nd qtr almost always produces the highest sales volume, followed by quarters 3 and 4. Most people mistakenly believe that season results in the highest number of sales. Season may lead to some of the sales that result in the 2nd quarter, but that wouldn’t explain the strong 3rd quarter sales. Remembering back to the 1980’s our biggest closing months were generally in the summer. We usually found a lot of lookers in the season and many of those would come back and purchase in the summer. Additionally a lot of locals had more time to shop and buy in the off-season. SW Florida real estate isn’t as seasonal as many would think, although condos do still lend themselves to more seasonal traffic, especially 2nd home purchases. 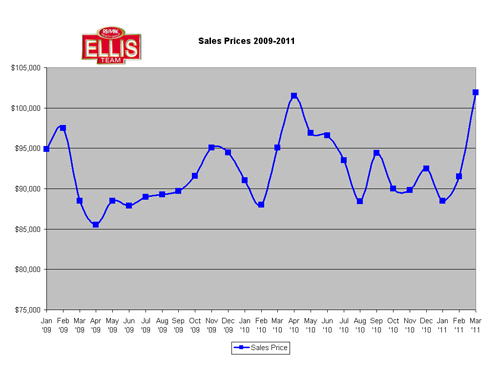 Depending on inventory, 2011 is on pace to place in the top 3 for all-time sales. Prices have risen 15.14% since January, and Lee County is one of the few markets actually gaining in price. It could be that Lee County was hit so hard due to high concentrations of investor homes that banks liquidated so much in the early years, and prices fell too far and too fast. Prices have fallen so far below replacement cost that virtually all building has ceased, and that’s a sign that the market has been artificially too low. As the rest of the nation enters a housing pullback, SW Florida is showing signs of bucking that trend. Will it last? That answer ultimately depends on jobs and the economy, as well as future foreclosure inventory that may come to the market. Foreclosure inventory can appear in two ways. First off we have a backlog of homes that began the process but were held up due to legal concerns in the foreclosure process. A few large foreclosure mills were processing foreclosures and collecting big sums of monies from the banks without doing the proper paperwork, and banks have had to start all over again on those proceedings. Secondly, Florida is a tort state, or what is referred to as a lien theory state, so it takes longer to foreclose than other states. As the economy has deepened, it has affected more people who weren’t investors, but got caught up in the bad economy and perhaps lost a job, had trouble collecting money from people who owed them money, etc. Because Florida has high unemployment, it’s natural to believe it will have higher foreclosures than other states. The big wave of foreclosure has already occurred, and Florida has largely worked through this, except for perhaps South Florida in the Miami/Ft Lauderdale areas. The wild card will be how many foreclosures hit the market. Right now we’re not seeing many and its forcing prices higher. At our current sales pace, we will eventually run out of inventory. The question and always has been, how many more listings will we see when banks are able to release inventory, and how many would be sellers will sell once prices reach the point where they can afford to sell. Inventory and the economy will drive this market, and nobody knows the answer to both these issues. As soon as these issued become apparent, so will the height and velocity of our market. Stay tuned and we’ll watch it together. The past few weeks we’ve written about home sale prices are at their highest level since December 2008, inventory levels are falling, and a breakdown of traditional sales versus distressed sales and how the market is changing. All signs pointed to rising prices the past several months, and that’s exactly what has happened. 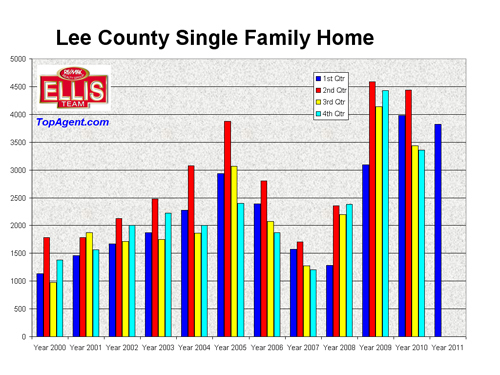 Median sales prices are up 15.14% since January in Lee County. How much of this is seasonal? We’ll attempt to answer this question. As you can see from the attached chart, home sales are seasonal and typically peak in March through May. 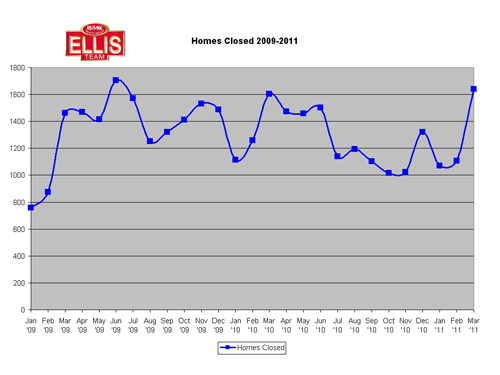 This year home sales in March almost equaled June of 2009’s recent high of 1,705 homes closed. We’ve been tracking pending sales which are also high which might indicate April and May sales could be high as well, all at a time when inventory is falling. When you combine high pending activity which leads to closings along with declining inventory naturally you might assume prices have room to go up. This is especially true as home sales are artificially too low because they are so far below replacement cost and there is built-in room for prices to go back up. Much like Wall Street, it’s difficult to draw conclusions on price gains or losses without also measuring volume. On Wall Street volume is defined as shares traded, and on Main Street volume is properties closed. 2009 was a record year for volume, followed closely by 2010. As you can see, 2011 is off to a good start, but the real test will be can the market reciprocate by bringing enough inventory to the market, or will volume fall off as less distressed sales come to the market? We believe there is an abundance of sellers who would sell if they could. They don’t want to short sell, but can’t afford to sell at today’s prices so they’re just waiting out the market. Prices are on the rise, but there may not be relief for many sellers because although the market is poised to rise, it won’t quadruple overnight if ever as jobs and the economy are still lagging, not to mention tight lending standards. So what does the future hold? Most probably we’ll see bouncing prices with a general trend upward. We’ll keep an eye on inventory released by banks. Banks have had some legal issues which has caused them to delay foreclosures but they’ve been working through these procedures the past 7 months or so and we should see more coming beginning in the next 2 months. The market is absorbing sales. Season is over and many of the 2nd home buyers have gone home although many return in the summer and purchase. 1st time home buyers and investors have been competing with each other for the bank owned bargains, and the investor usually wins with a cash offer. The variables in this market right now are bank owned inventory, jobs, the economy, and oil prices. Sales could decline if we don’t have enough sellable inventory, and of course ultimately the economy will drive sales once prices return to normal. The future is clear, the path is chosen. What is unclear is the timing and what variables may accelerate or knock us off our track. Stay tuned, and we’ll keep reporting what we observe. 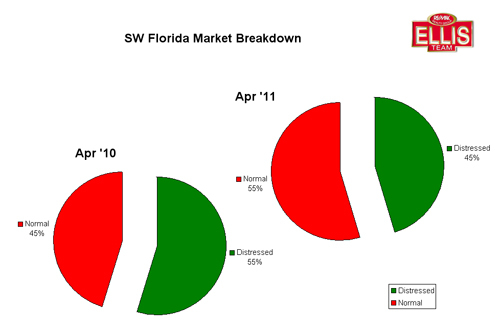 Median SW Florida single family home prices in December 2008 stood at $106,900 and were on their way down. In fact, the very next month in January 2009 prices stood at $94,900 and bounced around in the $80’s and $90’s until April of 2010 when prices jumped unexpectedly to $101,500 before settling back down in the $90’s for the rest of the year. 2011 is a bit different as we’ve been predicting prices could rise. Back in 2010 we had some equilibrium in that inventory was almost keeping up with home sales, so there wasn’t room for prices to jump much. This all changed in the latter part of 2010, and that trend has accelerated in 2011. Pending sales are strong, inventory is way down, and prices jumped 7.15% over last year. Median prices jumped 11.37% last month alone, and are up 15.14% from January. So what is driving these price increases, and why were they so predictable? Two reasons stand out. Inventory has been shrinking because demand is high and buyers are scooping up properties because Florida has been on sale and they realize the train is leaving the station for the best buys. The second reason is banks have had difficulty bringing foreclosures to the market in light of investigations into bank practices submitting proper documentation in the foreclosure process. Many of these mortgages were sold as securities and banks must prove that they are the owner of the mortgage and have the authority to foreclose. Banks don’t always have to produce the original note, but they do have to comply with certain procedures. Now the courts are even under fire for their role in pushing these through so quickly. Lee County adopted the Rocket Docket which included hiring additional judges for the sole purpose of hearing foreclosure cases. There was a huge backlog facing the court and the Rocket Docket helped ease that pressure. Were some of the past foreclosures rushed and fully documented? We’ll let the legal professionals answer that one, but it’s fairly safe to assume these processes are being followed much better now as banks, attorneys, and the courts are taking their time and crossing the T’s and dotting the I’s. We do know more foreclosures will be released. The question is when, at what rate, and how many more? We’ve been hearing starting in about May or June to get ready for more. We don’t believe it will be a slammed pace like it was back in 2009. We also don’t believe it will be in those quantities, unless the economy deteriorates further leading to more foreclosures. Under these assumptions, prices should hold steady and/or continue to increase going forward, at a sustainable pace. We don’t believe prices will skyrocket back to 2005 prices anytime soon, nor should they. They were artificially too high back then, just as they are artificially too low now. Additionally, the initial foreclosures were at the lower end of the price spectrum. Newer foreclosures have tended to be larger homes at higher price points, which should also lead to higher median prices as these properties sell. It’s getting very difficult to find homes under $100,000 in Cape Coral or those $30,000 Lehigh Homes we used to see. The only $30,000 homes we see now have defective Chinese Drywall or other problems. So don’t be surprised if prices stay where they are, or bounce along with a general trend higher in the coming year.